Well you all must think I gave up, being silent for this long. But fear not, this morning I measured the heights of the saddles-to-be and I'll shape them as soon as I can. Then it's glueing time and then we move on to the finishing. One of these will go to Mary Agnes Krell and GNUF. Maybe it'll be in a raffle, maybe it will be auctioned. I'd love to go to GNUF. My meter of piccolo bridge blank was spent so I needed a new one. Not a meter maybe, but something enough for a few ukes. I shape each bridge a lot after cutting the blank to length, so it could be square in section. But I like having the [extremely] rough section ready, and it saves me the effort of deciding where the grain direction goes each time. 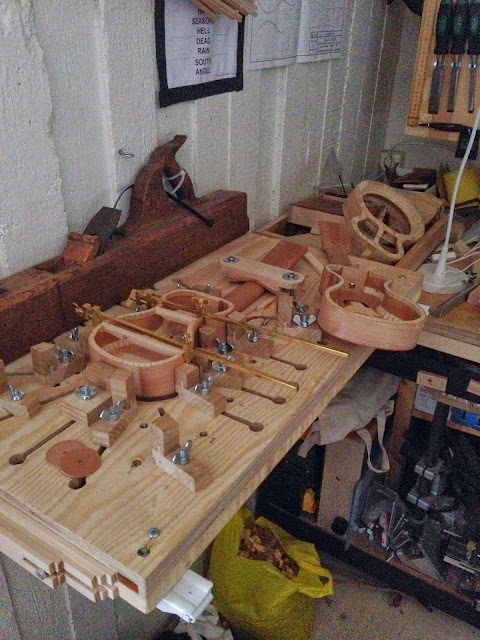 But in keeping with the seemingly low tech approach of the two current builds I decided not to use my mini table saw. So I reached for, ahem, a few hand tools. 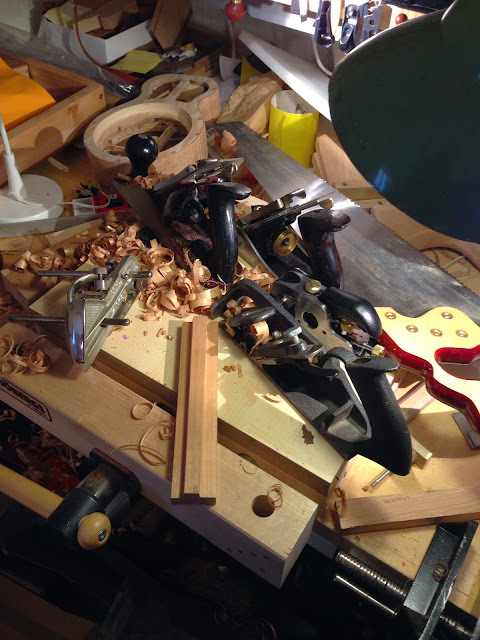 A jack plane, a smoothing plane, my giant rip saw, a rabbet plane, a small plow plane and a bullnose shoulder plane. It only took a little longer than it would have with setting up the table saw and use that, and the resulting surfaces are better. I'll rip this double sided bridge blank down the middle and it'll be enough for six piccolos. 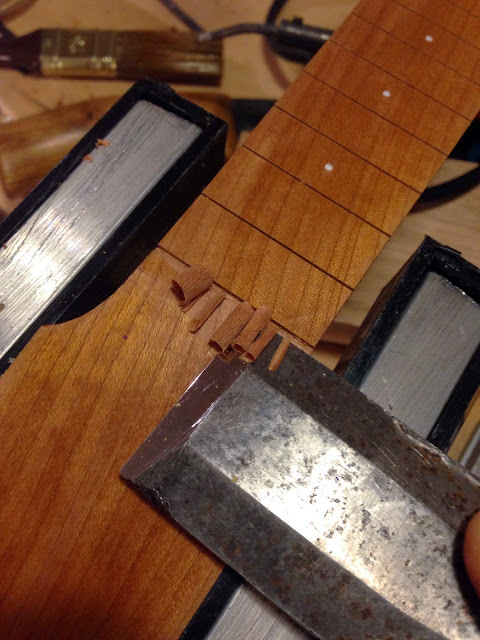 I have slotted both necks, and now I pare away the wood behind the last slot which is the nut location. I always use my short E A Berg chisel for this. I'll let the pics tell the story. With the neck joints good and the top and back trimmed on both piccolos I set out to scrape them smooth. Turned out to be quite a challenge, and working with them under my nose I saw divots and small marks I hadn't seen before. And how do you round over edges without sandpaper? After giving it some thought I mixed up some new shellac and gave them a rather heavy wash coat each. Rather heavy - I slathered it on, all over except for the lower but on the top. I'll get to that after glueing the bridges. 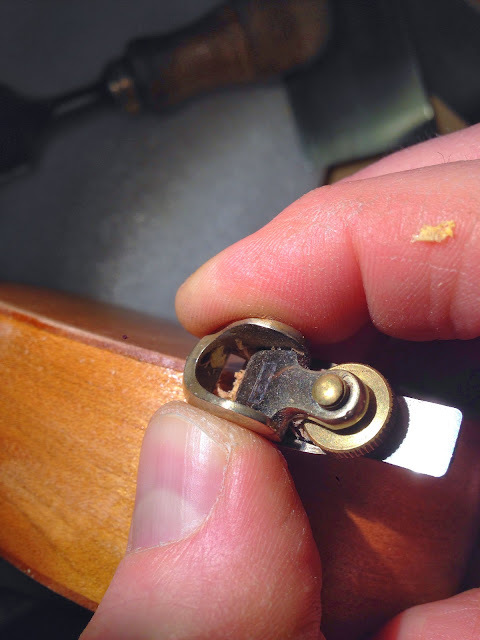 Then when the shellac was good and dry I scraped it back with properly sharpened and burnished scrapers. Success, now they're smooth. A combination of sealing the grain and a minor pore fill, and cutting down any raised grain. 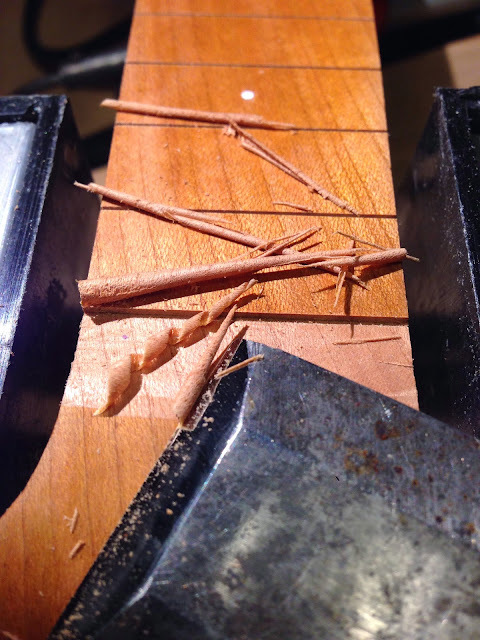 Then it's time to slot for the frets. 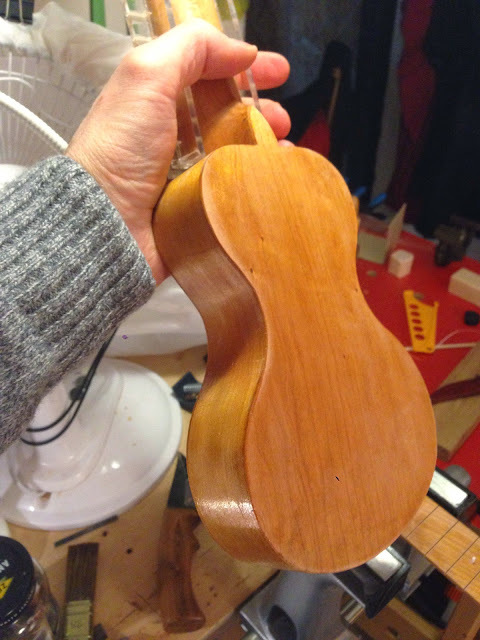 I always put shellac on the face of the neck before I do this so the only departure from protocol was coating the rest of the uke before this stage. 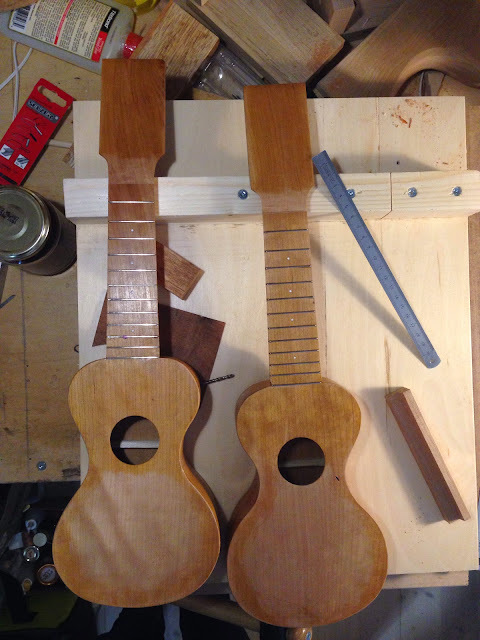 Since my piccolos are "island style" with frets directly in the neck I slot the necks with a hand saw and a very nifty jig I made. The jig is on the uke in the back. The one in the vise is slotted. 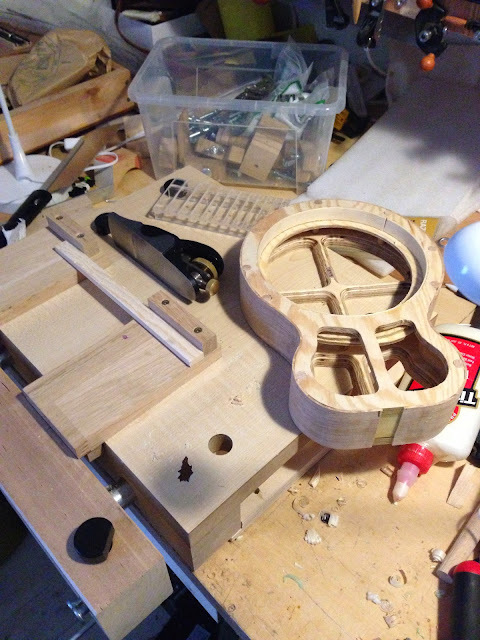 The jig is held in place with four pieces of 1.6 mm styrene rod that sits in holes drilled in the neck. 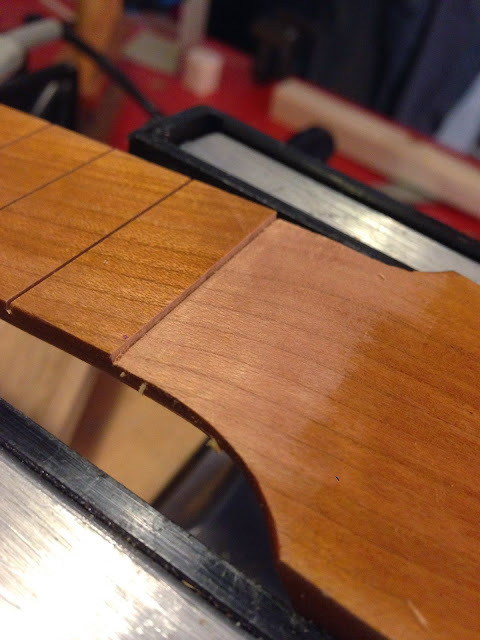 After sawing I put a drop of glue in the holes and cut the rods flush and voilá, instant fret markers. Last pic to give you an idea of the surface as of now. Goodnight! 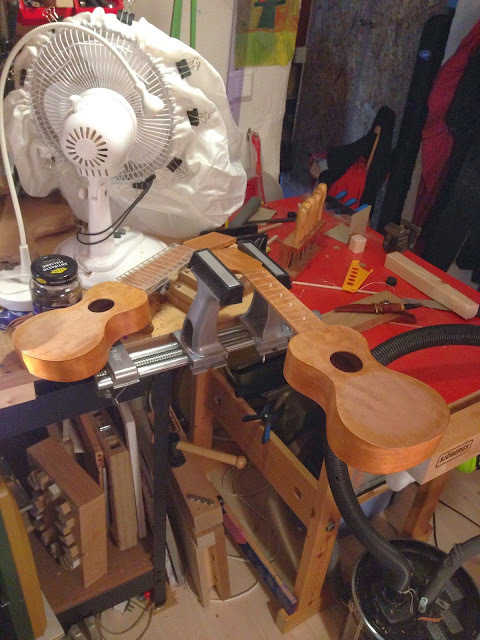 Between tool making and upgrading jigs I've managed to finish the necks for the zero sanding piccolos, and to glue the sides on the resonator I'm making for my mate Andy. In the first pic you can see the back braces fitted in one of the piccolos. I do it like this because it works for me. I've heard of others putting the back braces in before the back, but I can't really remember where. Second pic shows the clad reso, and two small bench hooks. Build these! They are an amazing asset for working with small parts. But build a wide one and cleave it into two, I made mine separately and it was quite tough to match them afterwards. I admit things like this in an effort to help others but I know it makes me seem daft.